Just 12 miles off the coast of Playa del Carmen, along Mexico’s famed Riviera Maya, Cozumel is a well-established, world class vacation destination. Especially known for its warm, tropical water, snorkelers and scuba divers from across the globe enjoy exploring the island’s reef, teeming with aquatic life. Average temperatures in the 80s F make for comfortable weather with breezes off the Caribbean providing some cool air during the hottest months—when temperatures can climb into the 90s F.
At 30 miles long and 10 miles wide, Cozumel is just the right size to get around on a bicycle or motor scooter, but taxis are abundant too. The island’s largest town is San Miguel. With some 100,000 permanent residents, San Miguel is a lively tourist town. With hundreds of small gift stores, restaurants, night clubs, and bars attending to millions of tourists each year, San Miguel serves its purpose flawlessly. Tourism provides the high-octane fuel for the island’s economic engine. The bustling port in San Miguel accommodates between 4 to 5 million cruise ship passengers annually. Huge ships arrive each week (more during winter than summer), dropping their passengers into the central area of San Miguel, staying just long enough for passengers to enjoy the day, take an excursion, and rack up a few charges on their credit cards. Cozumel also has a busy international airport and a regular ferry service from the mainland in Playa del Carmen. A small fleet of modern, fast catamaran shuttles charge $20 for a roundtrip ticket and the ride takes about 45 minutes each way. Those wanting to enjoy an active, lifestyle while also appreciating the pleasures of island life may wish to consider Cozumel for their retirement home. In addition to unlimited water-born recreational opportunities such as boating, fishing, swimming, snorkeling, scuba diving, sailing, and kayaking, Cozumel also provides modern infrastructure with a stable electrical grid and high-speed internet. Warm, tropical weather throughout the year is a draw for many people and Cozumel offers that in ample supply. This is an area subject to hurricanes, however, and Cozumel took a couple of heavy hits in 2005 from hurricanes Emily and Wilma. And while they don’t happen often, residents pay close attention to the weather during hurricane season. Shopping opportunities are abundant with modern grocery stores offering a large variety of goods. Residents can enjoy the benefits of a thriving tourist community with ample selections of restaurants serving all kinds of food from around the world. You can even catch a movie at a local theater, if you wish. As with all islands, prices for goods and services are higher than those on the mainland by some 20% to 30% on average. Medical care on the island is provided by three hospitals and a number of clinics for routine care. And of course, the mainland is only 12 miles away, so access to larger hospitals in Playa del Carmen and Cancún is readily available, as well. 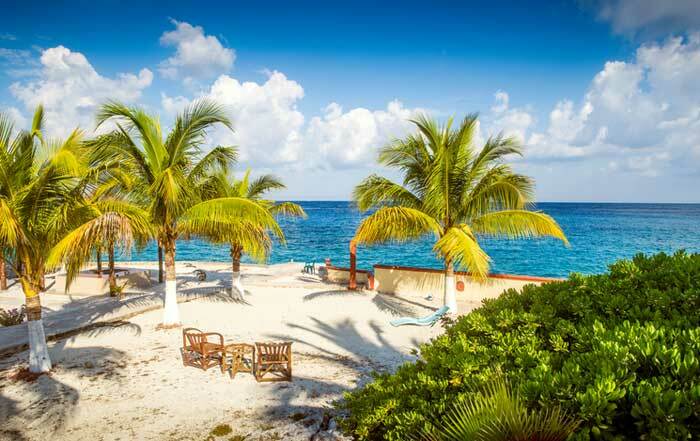 Cozumel is a great choice for expats looking for island-life. 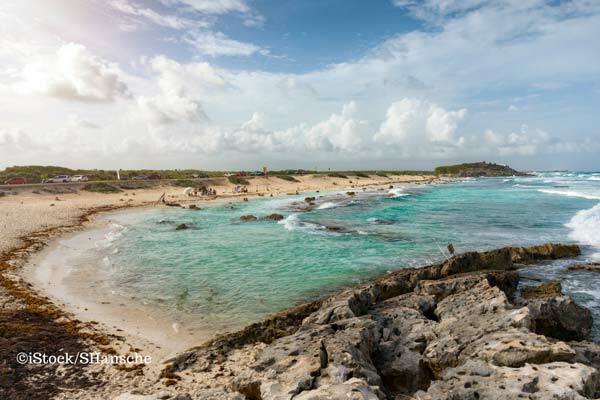 It’s large enough to offer many conveniences without going to the mainland, but its proximity also allows residents to quickly catch a ferry and spend some time in Playa del Carmen, Cancún, or even to explore the historic Yucatán Peninsula. Permanent residents on Cozumel can choose to live in San Miguel or several smaller communities on the island. Las Fincas, Kilómetro Cuatro y Medio, La Estrella, San Lorenzo, La Esperanza, and Huerto Familiar are all smaller villages primarily occupied by locals of Maya and Mexican ancestry. Cozumel’s primary draw is the surrounding, clear Caribbean water and the easy access to shallow reefs for divers and snorkelers. The island offers a choice of many beaches. Some are rocky limestone, perfect for snorkelers, while others are covered in powdery white sand and are just right for lounging and reading a book. Hundreds of dive boat operators compete for business in the harbor while several private access points along the shore permit divers and snorkelers to enter for a small fee. Public beaches, of course, have no fees. If you’re looking to get away from the water, plan a trip to the El Museo de la Isla de Cozumel (The Museum of the Island of Cozumel). It provides an insight into the history of the island and its ancient Maya inhabitants. Afternoons allow time for catching a movie at the modern theater or even visiting the local library. The very active night scene offers live music and dancing in clubs and bars, as well as free performances in the central park. Spanish is the official language; however, many restaurant and tour employees speak some English. Cozumel offers good value for dollars spent, even when it comes to housing. However, it can be hard to find an apartment as the market is geared toward short-term vacation stays. You will most likely have to rent a place, short term, while you search for a long-term rental. Also, most long-term rental properties come unfurnished. Those advertised as “furnished” may be sparsely furnished, at best. With limited land available, condos are the most popular housing option on Cozumel and good deals can be found in the range of $150,000 for one-bedroom units. Two-bedroom units can run upwards of $180,000. 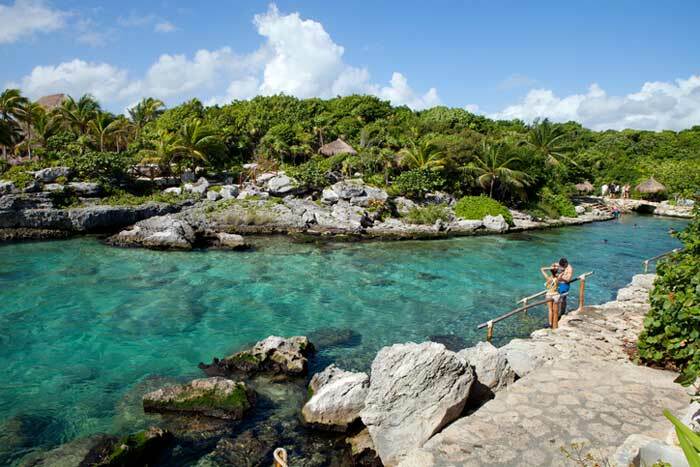 Cozumel is a perfect blend of laidback island life with tons of activities to enjoy. Here you can have as relaxed or active a retirement as you want. You can park yourself on a perfect stretch of white-sand beach for the day, listening to the waves as you read the latest best-seller, or don a snorkel to explore the Chinchorro Reef, the world’s second-largest reef system, just offshore. Clear waters make it easy to see (and photograph) sea turtles, rays, and colorful clown fish. You can even make arrangements to swim with giant whale sharks. Lying only 12 miles offshore from Playa del Carmen, about an hour south of Cancún, Cozumel is about 30 miles long and 10 miles wide. But this small space has a lot packed into it. With over 300 restaurants, delicious meals of all varieties are easy to find. You can buy a couple of fish tacos for about $5 and wash them down with a $2 local brew, or splurge on an elegant steak and lobster dinner by the sea. 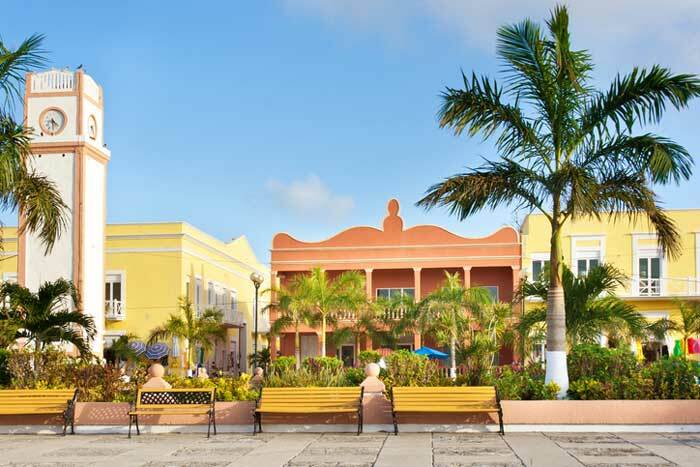 The bulk of Cozumel’s population calls the city of San Miguel home. There is a busy malecón, or main road, running along the shoreline near the ferry terminal and cruise ship docks. Arriving by boat, you’ll find a vast array of tourist-oriented shops, restaurants, and bars. A few blocks inland will put you into local neighborhoods, where small houses and apartments line the streets and groups of uniformed children walk to and from school. Raise your eyes and you’ll note luxury condo buildings along the horizon, offering all the contemporary amenities. Long-term rentals, while sometimes hard to find, can be had for $450 to $1,500 and more a month. The price depends on size, location, view, the condo’s condition, and furnishings. According to 15-year expat resident Luh McDevitt Madera, you don’t need a car on Cozumel. Locals and tourists alike prefer motor scooters and various off-road vehicles to scurry around the island. Aside from getting caught in the occasional rain shower, scooters are cheaper, easily parked, and (using appropriate safety gear) can be safe and fun. Walking and taking taxis are also options. Cozumel’s nightlife starts around 10 p.m. Local bars, discotheques, and stage shows deliver endless entertainment options, including traditional Mexican music and modern rock bands. Señor Frog’s is a 100% Mexican bar, nightclub and restaurant with great food, spontaneous choreographed dance performances by the staff, and a party atmosphere along with large, signature drinks. Fat Tuesday’s is another place that’s always lively and serves great frozen cocktails. You can find it right on the main square, close to the ferry terminal. Public stages offer such delights as Maya fire dancing exhibitions and live music. For those wanting a tamer evening, cinemas offer movies in English and Spanish; some include subtitles. The Cinepolis in the Chedraui Plaza is a modern, seven-theater complex with stadium style seating and very reasonable prices ($3 to $5). Cozumel offers world-class shopping, with everything from precious gems to handmade artisan clothing and pottery, as well as all your daily essentials. Most of the shopping can be found in Ave 5 and Ave 10 or the area around the Plaza del Sol. This area, along the waterfront, is dense with small shops and some larger stores. (For good deals, go to Cinco Soles, an expansive store right on the waterfront with crafts from all over Mexico. It also has a tequila bar for sampling from their large selection.) Food and all other consumables are shipped to the island (making them somewhat more expensive than on the mainland), and fresh water is provided by several desalination facilities. Cozumel also has several good medical clinics and two small hospitals. For major emergencies, Cozumel Medical Center is the place to go. Being an island, Cozumel is more expensive than many of Mexico’s other retirement hubs, and you should budget accordingly if you plan to live here. Luh and her husband Moisés believe that a couple can live a very nice, retired life on Cozumel for around $3,000 to $4,000 a month. But if your budget can stretch that far, you can enjoy a fantastic retirement here among a thriving expat community.